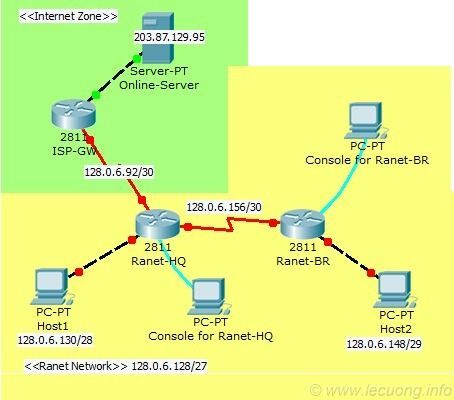 You are the network administrator at Ranet, and have to config the routers both Ranet-HQ and Ranet-BR to make the connection throughout Ranet network and with the Internet. Hi there and thanks for your labor. I am new to networking studying for my CCNA and thought I was good at subnetting until now! ;-) Anyhow, I have a question about the subnetting on the LAN side of the routers. Take RanetBR for example: Doesn't /29 mean there will be 8 hosts available on that network? So with a network address of 128.0.6.148, the broadcast address would be 128.0.6.155, thus the last assignable IP is 128.0.6.154, right? I tried this and as you might predict it said that that address overlapped with the WAN between the routers. Can you tell me where my reasoning is wrong? Thanks. IO thought the same could go for RanetHQ too but I get the same error. Appreciate any help you can offer.